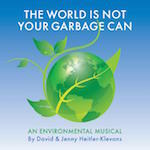 David & Jenny of Two of a Kind have written an environmental musical for kids to perform. This musical features an original story & music, for grades 5-8. "Sloppy Joe" is a messy kid without much sense of responsibility, who changes his ways with the help of friends and a school clean-up. Joe and his friends then work together to face a big environmental challenge in their community. Catchy songs, humor, and great messages make this a fun and valuable musical for kids to do and to see. 29. What Happened to You?